RIO Products has announced its new InTouch Scandi 3D line, a Scandinavian style shooting offering a triple density coating for maximum fishing control. 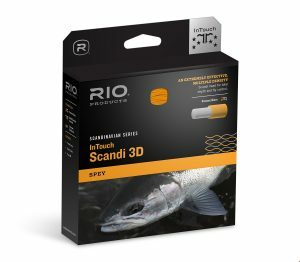 IDAHO FALLS, IDAHO (October 2, 2017) – RIO Products, manufacturers of fly lines, leaders, and tippet material, offers fly fishers its new InTouch Scandi 3D line with a triple density coating for maximum fishing control. RIO’s InTouch Scandi 3D is a Scandinavian style shooting head that seamlessly integrates three different densities along the length of the single head for ultimate depth and fly control. This line easily cuts through the wind and current to allow the fly to swing deep without snagging the bottom when the current slows. Built around RIO’s ultra-low stretch ConnectCore, the heads provide enhanced sensitivity, faster hook sets, and total control when fighting fish. There are three different density combinations available. The floating/hover/intermediate head (F/H/I) is ideal for swinging flies in the top one to three feet of the water column. The floating back portion makes mending and pickups easy, while the hover mid-section and intermediate tip keeps the fly at the ideal depth for summer steelhead, salmon, and easy flows. The hover/intermediate/sink 3 head (H/I/S3) is a better choice for deeper presentations or heavier currents with the fly swinging two to five feet below the surface. The hover back section allows for easy casting and line control, while the intermediate mid-section and sink 3 tip ensures the fly swings deeper – ideal for faster currents or cooler water temperatures. The intermediate/sink 3/sink 5 head (I/S3/S5) gets the fly down deep and fast and is a great winter steelhead or back end salmon line. The fast sinking front section allows the fly to swing between four and 10 feet in depth, yet the graduated density allows for outstanding line control and easy casting. Find these heads at any RIO dealer for a retail price of $59.99. For more information on this line, watch the video here.